In the city of Las Vegas, Detective John Sheppard must solve the case on a long string of unusual murders -- perpetrated by a Wraith in hiding. Detective John Sheppard pulls up in his car and surveys a crime scene in the desert. There is a tire imprint, a pool of radiator fluid, and a dessicated corpse. Its mouth is open. There are five finger prints above the chest wound. It is clearly the victim of a Wraith feeding, and it is the eighth of its kind. But he doesn’t recognize it — because this isn’t the John Sheppard that we know. At the Las Vegas morgue, Sheppard is surprised to find a Dr. Jennifer Keller performing the autopsy rather than the usual coroner. She notes that the victim died of rapid cellular breakdown. Sheppard tells her to look for radioactive residue. Police Captain Hendricks arrives at Sheppard’s office with FBI Agent Richard Woolsey. Concerned about the increasing numbers and boldness of the killer, Woolsey wants cooperation. But Sheppard has nothing to offer. A call provides Sheppard with a report about a man who may have radiation poisoning. At a cheap motel where he is staying, the man vomits into the toilet. His nose is bleeding — again. Loud, pulsating rock music penetrates the motel room’s thin walls. He goes next door to complain, but the “man” who opens the door is a Wraith. 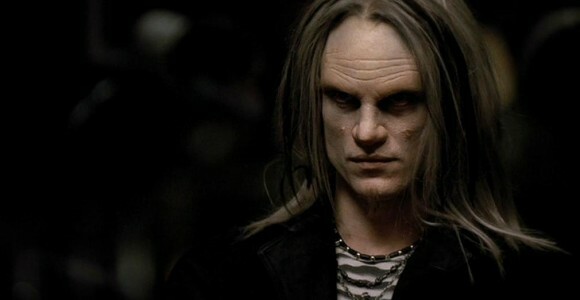 He feeds before disguising himself with black leather clothing, makeup, prosthetics and contacts. A little Goth goes a long way toward disguising a Wraith in Las Vegas. Sheppard locates the motel where the ill man stayed, and stakes it out. He watches as the Wraith leaves, walking past a silver motor home and a pick-up. Sheppard follows him to a casino. Inside, the Wraith plays in a private poker game with a table of professionals and mobsters. He is winning (thanks in large part to his mental powers) when John joins the game. As the Wraith gathers the chips from a hand Sheppard has lost, one of the mobsters objects, grabbing the Wraith. The creature throws him into a glass coffee table and flees. A security guard shoots, but it doesn’t stop him. Sheppard pursues the Wraith through service areas to a rooftop exit. The Wraith runs to the edge of the building, leaps, and falls several stories to the ground below. Sheppard watches, amazed, as the Wraith picks himself up and runs off — thanks to his rapid healing abilities. Returning to the motel, Sheppard and the manager discover the victim’s body in the Wraith’s room. Sheppard also finds the make-up, and a valise full of money. Stowing it in the truck of his car, he notices radiator fluid where the pick-up and motor home had been parked. Sheppard appears to be ready to leave town with the money when he is accosted by Woolsey, who takes him to Area 51. When he refuses to sign a confidentiality agreement, Dr. Rodney McKay intervenes. He insists that they tell Detective Sheppard what they know, believing that he can help them find the Wraith. After demonstrating that he knows all there is to know about Sheppard (including his spearmint gum preference), Dr. McKay tells Sheppard about the Stargate, the Ancient chair from Antarctica, and a version of Sheppard he once met from an alternate reality. Three months ago, when the desiccated corpses first showed up, there was a gigantic space battle above Earth. The chair was used to fire drones, which destroyed the invading Wraith hive ship. Almost all of the Darts were brought down. McKay shows Sheppard mangled Dart remains and explains who the Wraith are. When Sheppard asks what the Wraith look like, McKay introduces him to a Wraith prisoner they are keeping — this reality’s version of Todd. Starving and delirious, Todd still mesmerizes Sheppard. As Sheppard collects himself, he recognizes Keller walking through the corridor and realizes she works with McKay. The desiccated corpses indicated that another Wraith had survived the attack, this one undetected. What he was up to and why such frequent feeding were mysteries until they found his scavenged Dart. As Sheppard and McKay pass through a conference area, McKay and Dr. Radek Zelenka pause to wrangle. Rodney believes the Wraith is seeking to communicate with the Wraith in the Pegasus Galaxy. Zelenka is afraid the device that the Wraith is making could open an inter-dimensional rift. Or it could be a bomb. McKay escorts Sheppard back to the FBI vehicles. He revealed the truth to Sheppard, he tells him, because McKay believes he has the same strength of character as the other Sheppard. Back in his office, Sheppard abandons his police badge and pistol and walks away with only his Johnny Cash poster. With Cash’s “Solitary Man” blaring, Sheppard drives a desert road. He is leaving town with the money he found in the hotel room. As he glances at the bag of money in the front seat, images flash through his mind. Suddenly realizing where the Wraith is, he turns the car around. Locating the motor home near a remote power line, Sheppard phones McKay. Sheppard has realized that the Wraith needs power, and will try and tie into the city’s power grid. Keying on the beacon in Sheppard’s car, an Air Force strike team launches. Inside the motor home, the Wraith initiates the communication device — attempting to send a message to the rest of the Wraith and tell them how to find Earth. Hearing Sheppard arrive outside, the Wraith arms himself. Sheppard draws his weapon and approaches. The Wraith fires one shot, hitting Sheppard. He empties two clips into the Wraith, taking shelter behind his car as the Wraith emerges with guns blazing. Out of bullets, Sheppard is cornered. But the Wraith retreats to his creation when he sees the jets approaching on an attack run. He boosts the device’s power, emitting a signal just before the motor home is destroyed. McKay decodes the signal transmitted by the Wraith. It contains the location of Earth. If not for Sheppard, the message would have reached the Pegasus Galaxy. Before its destruction, the device did, however, create a tear in the space-time continuum — directing the message to the Wraith of other realities. So while this Earth is safe from the Wraith, other realities may not be so fortunate. John Sheppard, the Solitary Man, lies bleeding out in the desert as the sun sets. “Vegas” shot partially on location in Las Vegas, Nevada — a rare trip “south of the border” for the Vancouver, British Columbia production team (though of the main cast, only Joe Flanigan (“John Sheppard”) got to go. This location shoot also made up the final days of filming for the last season of Stargate Atlantis. Several famous faces make cameo appearances at the poker table, and not just The Sopranos‘s Steve Schirripa and Frank Vincent. Also present are professional poker player Todd Brunson (son of the legendary poker champion Doyle Brunson), Stargate composer Joel Goldsmith, and MGM senior executive vice president (and Stargate fan) Charlie Cohen. These and the casino scenes were filmed at the Planet Hollywood hotel on the Vegas strip. “Vegas” is “an alternate reality story” that is set on “a slightly askew version of Earth,” writer/director Robert C. Cooper told the Las Vegas Review-Journal. In that world, John Sheppard became a homicide detective. Sheppard finds himself tracking a Wraith who uses make-up to blend in among humans. The Wraith even ends up in a high-stakes poker game with Sopranos veterans Steve Schirripa and Frank Vincent. That 9-story fall was one of the biggest stunts ever filmed for a Stargate episode. But it took a couple of tries. After multiple hours of set-up “Action!” was called and the stunt went off flawlessly … only for the crew to discover that the cameras were not rolling. VOTE! How would you rate Atlantis's "Vegas?"